Our product range spans from big klystron RF systems for science applications to smaller magnetron systems adapted for cancer treatment as well as electron guns and pulse generators for treatment of foodstuff. 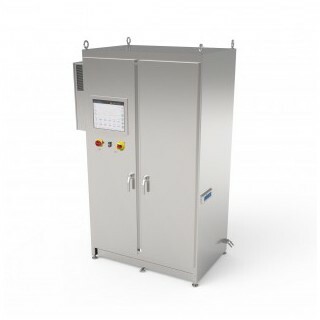 We can deliver a pure high voltage pulse modulator all the way to a turn-key RF station including complete low level RF, diagnostics and everthing inbetween. The Pulse modulator technology developed by ScandiNova is the base in all of these systems. See our different series below. If you have other loads don´t hesitate to contact us. Applications include Pulsed Electric Field (PEF) generation in food processing. We offer modulator, control- and cooling systems. ScandiNova Pulse Generators cover a wide power range. PG200 is designed to provide electrical pulses up to 28 MW, it provides unparalleled performance and ease of integration and use by customers. The PG-series pulse generators are used in demanding industrial applications and are perfectly suited for research needs where mid-range pulse generators are needed.